Frame rate is capped at 31 FPS. See High frame rate. Game activation when launching the game for the first time. All remaining versions outside retail/Steam require Origin DRM. FPS is capped at 31 FPS, running above may cause issues. See High frame rate. Be aware that you first need a modified game .exe for the tool to work. Turn on Show hidden files in Windows and extract the files. 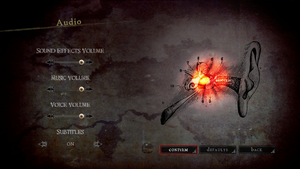 Run the tool and select the Alice: Madness Returns plugin. Set the Additional FOV Modifier to a higher value like +30.0 and click Set FOV Boost. Press NumPad 1-9 to decrease it. Press NumPad 1-9 and Alt to increase it. You may need to change it again a few times after completing a level or after some cutscenes. 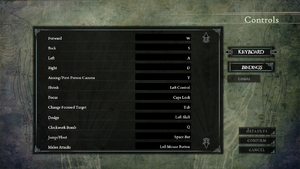 Click Edit Settings and create a profile named AliceMadnessReturns. Add forceBorderlessFullscreen true to the text editor and click save. Click User Whitelist and add AliceMadnessReturns and click save. Find MaxAnisotropy=16 and change the value if needed. Change UseVsync=True to UseVsync=False to disable. Causes hit detection issues when exceeding an unknown threshold. Be sure to cap the frame rate at 60 or 120 FPS depending on your monitor refresh rate to prevent major problems. Go to %USERPROFILE%\Documents\My Games\Alice Madness Returns\AliceGame\Config\. Near the top, change bSmoothFrameRate to FALSE or raise MaxSmoothedFrameRate value. May occasionally cause infinite loading screens when continuing a save. See Infinite loading screen. Suffers from negative mouse acceleration (the camera moves slower on faster mouse movements). Games first launch brings up activation window which requires keyboard. 3) Fan voice-over by «ElikaStudio». 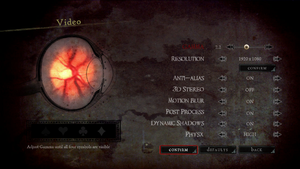 Labeled as "3D Stereo" under Video settings. If your game crashes, usually the game will lose the file PC_ProfileList.sav which tells the game your profile name and progress. Go to %USERPROFILE%\Documents\My Games\Alice Madness Returns and backup your profile folder as the next step will overwrite it. Start the game, create a profile(s) with exactly the same name as your previous profile(s) and exit. Replace the newly created profile(s) with your backed up copies. Start the game select your profile and it will say 0% progress with 0 time but it should resume from the correct place in the game. During the tutorial with the fight against a Menacing Ruin, the player is asked to use the Umbrella. However, the action cannot be executed regardless of focus or key-bindings. 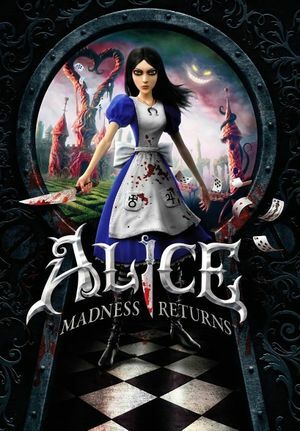 Navigate to Origin Games\Alice Madness Returns - The Complete Collection\Game\Alice2\AliceGame\Config\Default Input\. Change the E to whichever letter you want to be block. Save your changes and close out of the config file. 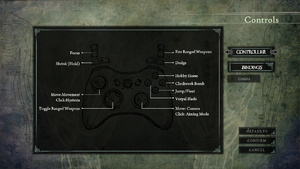 Start the game; go to the configure controls option in game; reset controls to default. Since default for block is now the key you assigned in the config the default controls will reflect this; you may now change the remaining controls to your preference. Make a copy of the DefaultInput.ini (for backup purposes) and open the original in Notepad. Start the game; no need to change any key bindings in-game as your block key should now work. Occurs when DirectX SDK, a developers' tool, is installed. Ensure that the 32-bit DirectX Control Panel (i.e. the DirectX Control Panel without "64-bit" in the title) is set to the Retail Version of DirectX 9. Find the DirectX Control Panel in the Start Menu, under Programs. On Vista or Windows 7, just type "DirectX" into the search. If the game crashes constantly at startup, run it as administrator for a more detailed error message. The game might be missing the file cudart32_41_22.dll, which the Steam installer doesn't include in the PhysX libraries. Go into the PhysX installation folder. (Most likely C:\Program Files (x86)\NVIDIA Corporation). Do a search for a file that starts with cudart32_41. For example, one version has a filed named cudart32_41_4.dll. Yours might be newer, but it should work fine either way. Copy that file into <path-to-game>\Binaries\Win32. Rename the file you just copied to the previously mentioned cudart32_41_22.dll. If you got a slightly different version in the error message, use that one. Answer the first question wrong and the second right, or the first two wrong and the third right, etc. It seems if you answer wrongly until one of the questions is read aloud, the bug does not trigger. Reloading a save file with the frame rate uncapped may result in an infinite loading screen. Change the resolution from the main menu to something significantly lower (720p from 1080p for instance). Change the resolution back in the pause menu once the game has loaded. Add the following lines in the [Engine.PlayerInput] section. 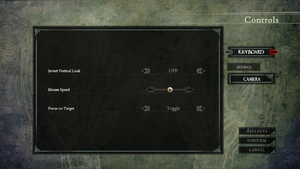 This will bind the divide (/) key on the numpad to toggling the HUD. You can use another key, as long as it isn't bound elsewhere already. Right-click the file, and tick the box "Read only" so as to prevent the game from reverting the changes made. Note that this will lock any input settings until you remove the read-only flag from the file. ↑ 1.0 1.1 File/folder structure within this directory reflects the path(s) listed for Windows and/or Steam game data (use Wine regedit to access Windows registry paths). Games with Steam Cloud support may store data in ~/.steam/steam/userdata/<user-id>/19680/ in addition to or instead of this directory. The app ID (19680) may differ in some cases. Treat backslashes as forward slashes. See the glossary page for details. +144fps was problematic while 120fps worked without any noticeable issues. This page was last edited on 19 April 2019, at 20:19.